Hitting a civilian with the explosion counts as assault. 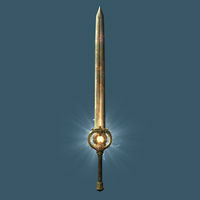 Dawnbreaker makes for a good weapon against vampires. On top of being very weak against fire, they are also considered undead, therefore they are affected by the fiery explosion. If you are playing as a vampire when the explosion occurs you will be affected by it and gain the active effect, Meridia's Retribution. The fiery explosion has the same visual effect and functions the same way as the Bane of the Undead spell. The description is slightly misleading, in that it is not necessary for Dawnbreaker to actually deliver the killing blow to an enemy for the explosion to trigger: as long as the target has been hit by Dawnbreaker within 10 seconds before it dies, it may still explode. The explosion effect has a tendency to knock items around, so players should be mindful of this in dungeons, especially with smaller items like rings. At the same time, this can also cause soul gems being used for spellcaster traps to be dislodged from their position, effectively disarming the trap. The enchantment of this weapon is increased if you have the Augmented Flames perk. The fire damage is increased to 12 if you have the first perk and 15 if you have both the perks. Though it can be tempered with an ebony ingot, it is not classified as an ebony weapon, nor is it classified as any other standard weapon material. Therefore, its upgrades do not benefit from any smithing perks, and, without a Fortify Smithing effect, it can only be tempered to Flawless quality. This issue has been addressed by the Unofficial Skyrim Patch; it now benefits from Daedric Smithing. Due to a bug in the related quest, you may gain two Dawnbreakers by using an area-of-effect spell to dislodge it from its pedestal. See this page for details. This bug is also fixed by version 4.1.3 of the Unofficial Skyrim Special Edition Patch.